A dual-language French and English edition of The Elves and the Shoemaker. Grimm's classic tale is magically retold in this beautifully illustrated bilingual story. Who are the secret helpers that come in the night and help an old shoemaker whose business is in trouble? And how can the shoemaker and his wife ever repay them? 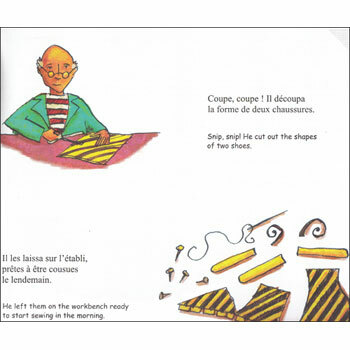 A dual-language edition with the full text in both French and English, this is equally suitable for French children learning English, or English-speaking children who are learning French. This book can be used alone as a traditional picture book, but it also has a very special added extra - if you own a PENpal Talking Pen, then you can download the audio for FREE and this becomes a talking book! Touch the corner of each page with the PENpal to hear a native speaker read the story you, in French or English, so that you can perfect your pronunciation & intonation. 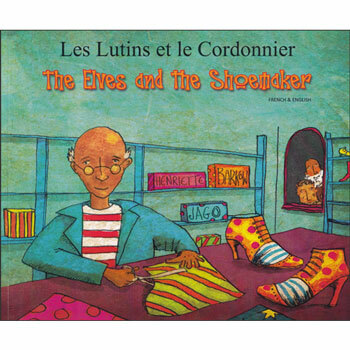 The Elves and the Shoemaker: Les Lutins et le Cordonnier is best suited to ages 5 - 9 (Early Years, Key Stage 1 and Key Stage 2).